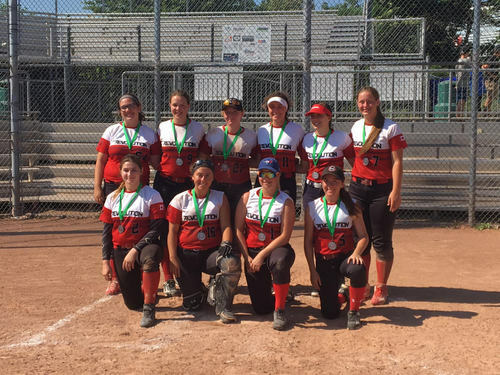 UTM Revolution 1 medalled this past weekend at the Kitchener Cornerstone Tournament during the Canada Day weekend. The open U19 event featured a mix of Tier 1 and Tier 2 teams. Pool play saw UTM finish with a 4-1-0 record to place 2nd in their pool. The cross-over playoff game pitted UTM vs Kawartha, and following that win the team moved on to the semi-final where they took on the Cambridge Coyotes, another win in that game sent the team to the Gold medal game vs Guelph. Under extreme heat and humidity the game with the Gators was one of the most exciting games of the 2018 season. Revolution scored three times in the first inning and held the lead until the final frame, when the Gators capitalized on a miscue to come back and win the game by a score of 4-3. Jillian Botting pitched very strongly in the medal game, which bodes well for the team as they head into the month of July with events in Innerkip, followed by the National Qualifer and Provincials.